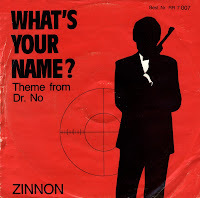 The Belgian act Zinno earned the status of one hit wonders with their single 'What's your name?'. The track was made with samples from James Bond movies, coupled with a dance beat. Zinno consisted of Fréderic Jannin and Jean-Paul Hautier. The refrain in this track was sung by Eleonore. The single was released on the Magic label, which was started by Dan Lacksman and Marc Moulin from the group Telex.